A friend of mine found this at the back of his shed and gave it to me for quite a nice price. 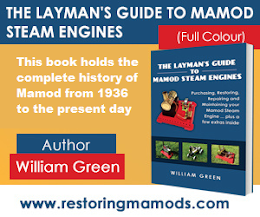 It is a Mamod SP2 stationary steam engine which, from the years my friend has had it, can be dated around the 1990s. This is a problem with the SP range. They are not really yet antiques since Mamod are still producing them. Therefore, although my SP2 engine is actually over 20 years old, because of the fact it is still produced today, they are not rare yet. One thing for sure is that an engine in such good original condition that is over 20 years old is quite rare! The last picture shows the engine being steamed up. The one thing I am not keen on about these engines is the fact the chimney is only there for its appearance. No copper piping is attached from the exhaust to the chimney. For this reason, you will never have the steam coming out of the chimney. Looking at the condition of the engine, it is in great condition. There is no rust on it, the paintwork is near immaculate with the chrome also being nearly spotless. For this reason, there is no need for me to respray the engine or take it apart. Only restore what you really have to. For this engine, I am only going to clean the flywheel, piston and boiler and just give all the paintwork a quick clean too. It really is amazing what a clean-up can do for the engine. The boiler is shiny without any scratches on it and the flywheel is also extremely shiny too. I decided to leave the peeling Mamod stickers on the base because it adds a it of history to it that it is quite old. A good tip to remember when cleaning engines with chrome work is that the chrome work is actually steel that has a thin layer of chrome on it. Therefore, if you are going to clean the chrome work with the same chemicals you clean the boiler with, you are risking going through the chrome. Chrome work only needs a slight polish and if the mark is not going to come out after that, you will have to leave it. A mark on chrome is better than matte steel.